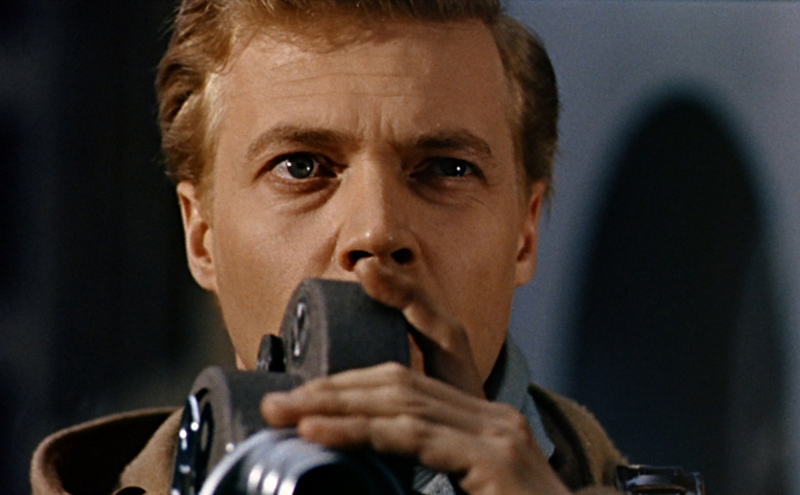 Peeping Tom (1959) | 'TAIN'T THE MEAT… IT'S THE HUMANITY! Michael Powell’s 1959 study of a serial murderer who films his victims last moments is as much a tour-de-force as his better known films, The Red Shoes and Black Narcissus to name a few. At it’s core the film depicts Mark Lewis, a psychologically damaged photographer (played with real compassion by german actor Carl Boehm) as he murders a string of London prostitutes and glamour models, filming their dying moments so he can watch their last moments again and again. But the film is so much more than than the study of a murderer and as the film progresses it becomes a carefully crafted essay on the voyeuristic nature of cinema. As a boy Mark’s psychologist father subjects him to various experiments to judge his reaction to fear and terror, even going so far as to film the boy’s response to his mother on her deathbed. As a result of these experiments the adult Mark has disengaged himself from the emotional and empathic world to such a degree that the only way he can feel anything is by reliving the deaths (and terror) of his victims over and over by watching the films in the seclusion of his flat. Although Powell falls just short of suggesting Mark is as much a victim as those he murders (therefore steering away from undermining the gravity of his crimes) his sympathies definitely lie with the killer. He is depicted as a shy, reclusive man who genuinely cannot relate to those about him, a hostage to his fathers barbaric experiments. But the films main theme is that of voyeurism. Mark films his crimes so he can relive his victims final moments, empathising with the fear they felt at the moment of their deaths. In turn we the audience are watching him for our entertainment and it’s with the films final reveal that Powell pulls off his masterstroke. All through the film we are shown that as Marks victims die they see something so horrible that their terror is intensified, increasing his attentiveness and our entertainment. It’s only at the end of the film that Powell shows us the source of this terror: Mark has a mirror attached to his camera and as he films their deaths his victims are watching themselves being murdered, thus the theme of voyeurism comes fill circle – we watch him as he watches them as they watch themselves. When the film was released it was savaged by the critics. According to them, Powell’s ‘crimes’ were threefold: deigning to make a film about a serial murderer; making a film that depicted the seedy world of London’s glamour photography; imbuing the character of a killer with a level of sympathy usually not tolerated in cinema. All three conspired to ruin Powell’s reputation. One critic memorably wrote: “the only really satisfactory way to dispose of Peeping Tom would be to shovel it up and flush it swiftly down the nearest sewer. Even then the stench would remain…” Compounding his crime, the role of Mark’s father is played by Powell himself and the footage of a young Mark was taken from Powells own home movies of his son. Powell, previously a darling of British cinema, never recovered from his pummelling by the critics. Although he directed a handful of films after Peeping Tom his career as an A-list director was over. The sad thing is if Powell had shot the film as a straight forward psychological suspense, more in the vein of Hitchcock’s Psycho (which was released a year later), then Peeping Tom probably would have been accepted as an instant classic of British suspense. Alas, that was not to be.